Since it has been introduced in 2017, Malawi’s Multi-Sector Nutrition Information System (NNIS) collects data from key government sectors such as health, agriculture, education and gender and implementing partners and converts them into information which can be used for planning and evidence-based decision making at district and national level. It was designed to address gaps in data management. Districts had the challenge of multiple information systems that were collecting incomplete data and unreliable nutrition information. In addition to programmatic data, the system has a resource tracking component to track financial and non-financial resources on nutrition across the country, i.e. expenditures, forecast, disbursements, commitments and commodities). The national M&E framework indicators are aligned to SDGs 2, 3 and 5. The NNIS collects data items on service delivery, infrastructure and human resources on monthly, quarterly or annual basis. Data are aggregated at district and national levels. At these levels, data are analyzed and converted into information and visualized on the system’s dashboards. Data is analyzed monthly, quarterly or annually as per need. The most critical step of the process is converting the knowledge to action. Constant efforts are made for government and other partners to use data for evidence-based decision making and planning at all levels. The NNIS information clearly identifies gaps and achievements in nutrition programming. This easily feeds into nutrition district and national level plans and target setting. The Food and Nutrition Security Programme is part of the global GIZ initiative One World – No Hunger. It supports the national Scaling up Nutrition initiative, which aims at combatting the problem of malnutrition in Malawi ⏤ especially among pregnant and lactating women, infants and young children (0-23 months). The Food and Nutrition Security Programme continues to ensure that the NNIS is disseminated and used by its partners. The program’s progress indicators have been aligned to the national M&E framework for easy collection and reporting of data into the system. It supports the capacity building of government and implementing partners in its implementation districts, Dedza and Salima. Continuous collection and interpretation of data in the district is a priority for the program. Efforts are underway that link the DNHA with district nutrition coordination committees to strengthen the capacity of district M&E personnel. At national level, the program also contributes to the annual resource tracking sheet. Malnutrition is an important public health issue, particularly among children under 5 years of age, who have a significantly higher risk of mortality and morbidity than older children. 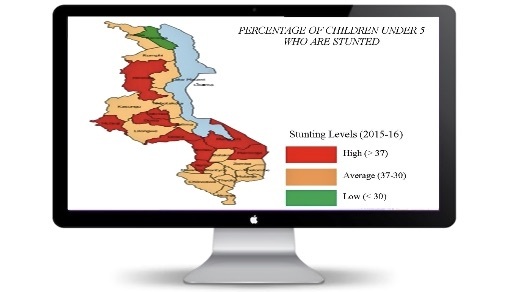 Due to frequent periods of food insecurity in Malawi, the population suffers from nutritional deficiencies such as high stunting rates (37%) among the under-five-year-olds. The Government of Malawi recognizes that adequate nutrition is a prerequisite for human growth and development as it plays an important role in one’s physical and intellectual development and consequentially their work productivity. It understands that the causes of malnutrition are multi-faceted. Therefore they require a multi-sectoral approach, coordination, and implementation platforms with clear terms of reference at all levels. The Department of Nutrition and HIV/AIDs (DNHA) developed a National Multi-Sector Nutrition Policy and Strategic Plan which are monitored through the Monitoring and Evaluation (M&E) Framework. The M&E is operationalized through the National Multi-Sector Nutrition Information System (NNIS) which is one platform spearheaded by the Ministry of Health – DNHA to monitor and track nutrition key indicators on a real-time basis. The system is used for evidence-based nutrition programming among all stakeholders; strengthening monitoring, evaluation and surveillance systems for routine information sharing and data utilization at all levels. The operationalization of the system is an ongoing process but it has contributed in achieving coordination and harmony in nutrition programming. We see evidence that the country has made strides to scale up nutrition activities and the NNIS is a step in the right direction. There is still a lot that we as partners can do to support implementation. Challenges with providing quality data on time still exist. The Food and Nutrition Security Programme has guaranteed to support all implementing partners with constant capacity building and follow-up. With continued effort, we’ll certainly achieve coordinated information sharing across sectors. Written by Alinafe Kamdonyo (alinafe.kamdonyo@giz.de) and Vitowe Batch, FNSP Malawi.